Its the time of the year that we all wait for; the time of the year where we put our exploratory tongues in action; its also the time of year where we eat like a baller on a budget…its Restaurant Week NYC. 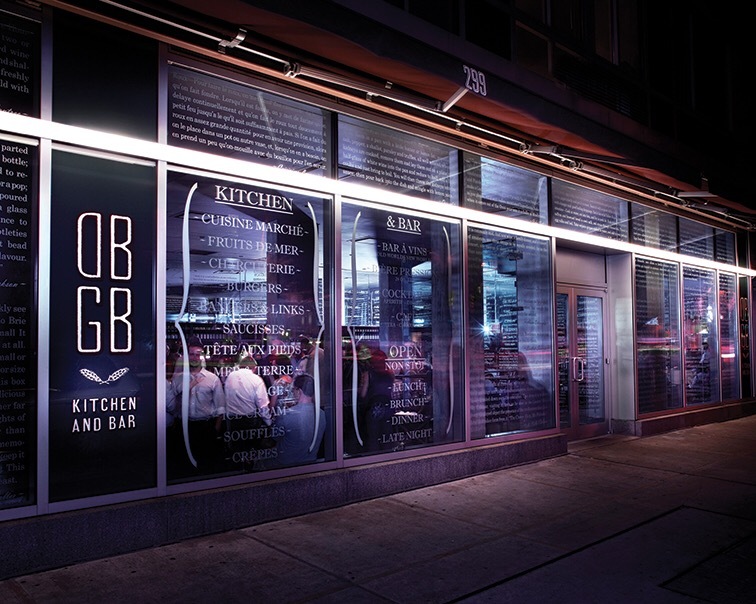 First up on my journey was DGDB Kitchen and Bar. Most times the prix fixed menus are simply put…sucky and I always find myself straying to the regular menu in an effort to find something to tantalize my palate, but not so this time. 1st course Grilled Panzanella Salad, a combination of goat cheese, seedless olives, & tomatoes with a vinegarette. Now it is here where I struggle, because I am not a tomato liker or lover, but I am a goat cheese and olive lover, so in mind the two items I would enjoy immensely would dominate the plate, unfortunately I was more than wrong. It was packed with tomatoes, sprinkled with little olives and the goat cheese was smudged on the side of the plate, which I assume was for decoration. 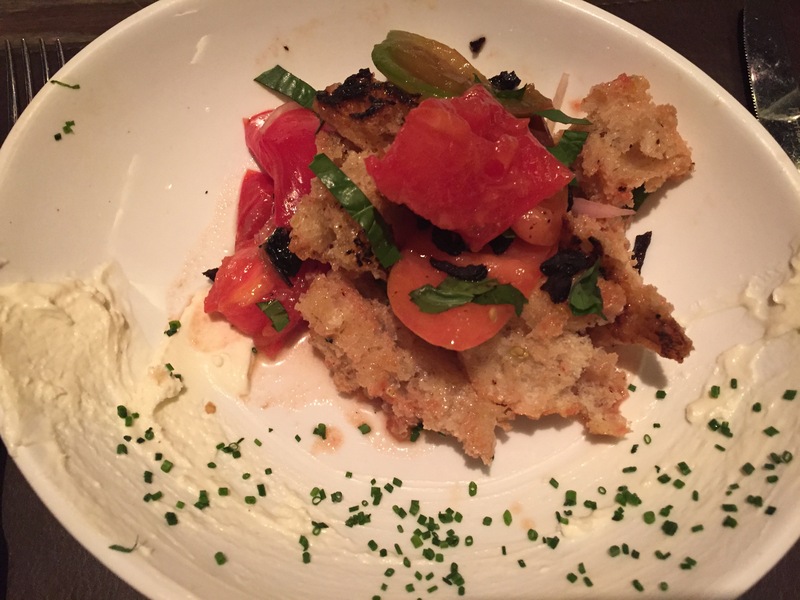 A few bites of olives coupled with the smidgen of goat cheese, and a crouton was mildly satisfying, but definitely not a slam dunk, and not completely delectable, but indubitably at no fault to the chef, it really was all due to my disinclination toward tomatoes. 2nd course Grilled Shrimp and Grits with chorizo, and the word that comes to mind with this dish is voila, flawless even. Plump shrimp, buttery, scallions atop, and the hearty amount of chunky chorizo. Now for all the chorizos lovers out there, you know that chorizo can be cooked and served in multiple ways. Sometime you find it in small squares, sometime just a sprinkle for smokiness sake only, and sometime simply rubbery, but not here. This chorizo gave me absolute sausage, spices visible and savory, a real sausage texture, and cooked to a tee. 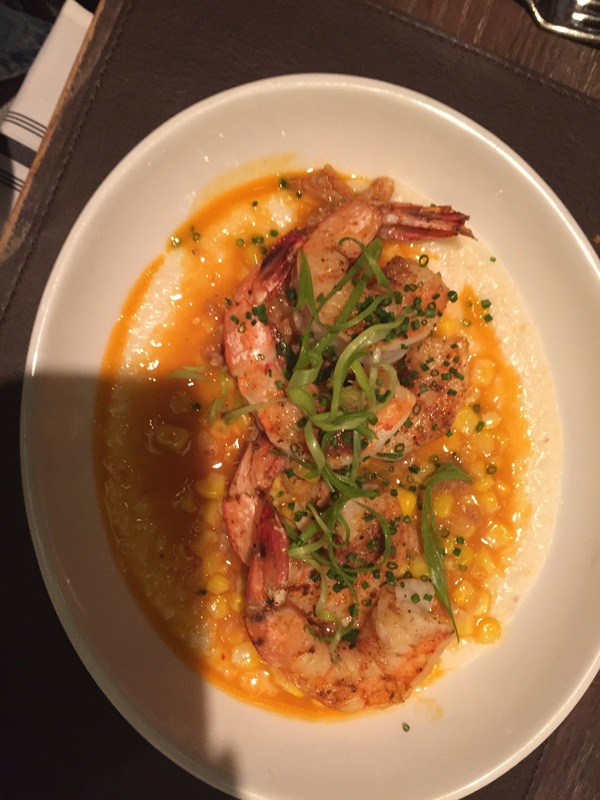 The topper was the corn kernels which was a constant reminder that you were eating grits with each bite, the grit crowning moment. The grits in itself could have been a smidgen thicker, but this is certainly a personal preference not a default on the side of DGDB. 3rd course a plum tart, yes plum, with blackberry ice cream, or should I write eat it slow and savor the thinly sliced sweet plums, laid so ever delicately on a tart crust with no custard, which was the absolute grand prize for me. 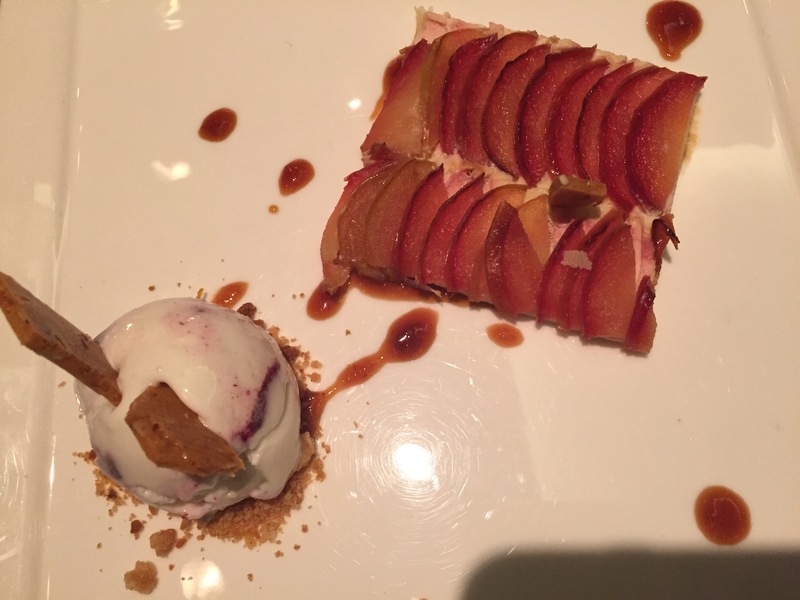 I think most tarts are visually appetizing, I always vacillate on whether I should try again, maybe my taste buds have changed and this time I am going to like the fruits swimming in custard, but my taste buds have not changed in this area, so this custardless tart was a tart from heaven as far as I was concerned. The blackberry ice cream with the toasted almond brittle was completely superb. The crunch of the brittle with ice cream, was amazeballs and somehow the perfect blend of sweetness on all sides, no water needed to wash it down. It has been a minute since I have had what I call an absolutely delightful meal, one that makes me smile, one that makes me brag, and one that made my eyes close just a bit with satisfaction, well done DGDB, well done. It’s only 7:56am, but I am ready for DGDB!!! !